Looking for sleeping mats? Check out our Buyers Guide! Sleeping mats - an important basis for effective recuperation! It is extra important to get a good night's rest if you're spending a few days in the outdoors. It is the only way to recharge after an active day, and your body will be ready for top performance once again in the morning. A sleeping mat will keep you from waking up with a stiff back or cold, as it will offer the necessary insulation from the ground. A sleeping mat doesn't actually warm you directly - it simply prevents the cold of the ground to cool your body. In effect, the air trapped inside the sleeping pad acts as insulation. It is important to ensure that this air stays put inside the pad, and that no heat exchange with the ground occurs. That is the job of the insulating materials in the sleeping mat. These materials will include foam rubber, synthetic fiber, and even down feathers. As in so many areas of outdoor products, there is also a huge selection of sleeping mats to choose from. You will want a light-weight sleeping mat with small packing dimensions if you are looking at several days on difficult terrain. Some people might also prefer an inflatable sleeping mat, which will offer enhanced ground insulation. The way you will use the sleeping mat will also play a big part in choosing the right one for you. How do you measure the level of insulation? The so-called R value specifies the insulating capacity of a sleeping mat. The higher the R value, the better the insulation of the material. The R value also states up to what external temperature the use of a sleeping mat would be sensible. If you put two sleeping mats on top of each other, you can simply add the respective R value! 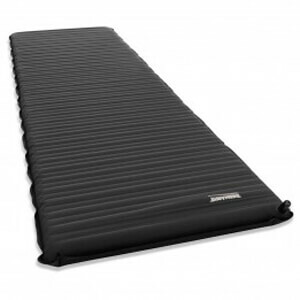 Then you will know up to what temperature you can use the combined sleeping pads for sufficient insulation. Which sleeping mat for which purpose? The most common sleeping mats are foam rubber mats, self-inflating mats, and so-called air mats. The latter category includes down-dilled sleeping mats, which have a particularly high R value. In air mats, the individual air chambers are filled with down feathers, which means you can comfortably sleep on the ground even in double-digit minus degrees. The advantage of self-inflating sleeping mats is their mostly pretty low price, high comfort, and small pack dimensions. The danger with these mats is, however, that they can get punctured, which will minimize the insulation effect. Traditional foam rubber pads are similarly very cost-effective, and are also very robust and winter-ready. They do, however, have greater pack dimensions, and are not as comfortable as other sleeping mats. You will find the perfect sleeping mat for your needs right here in our online shop - and our customer service team will be happy to help you choose the right one.